Annapoorni lost her father when she was only a year old. 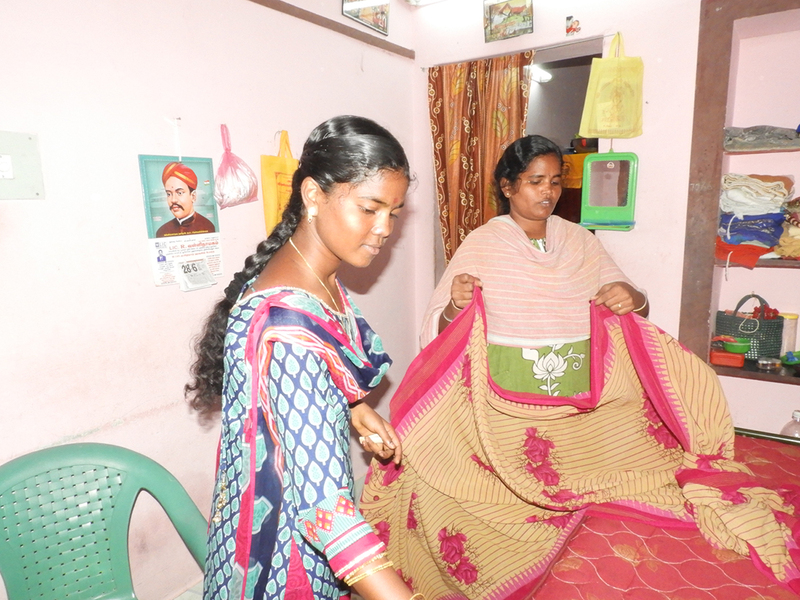 Her mother, a housewife, had to go to work to support them, but she motivated and supported Annapoorni to continue in school. Unfortunately another tragedy befell Annapoorni’s family when she was in 10th grade: her mother met with an accident, resulting in a broken leg that prevented her from returning to work. Annapoorni had no alternative but to discontinue her education to take care of her mother and provide for the family. She was just 16 when she went to work at a spinning mill as a helper. Working in the mill was very difficult for Annapoorni, bringing with it health problems. She endured them because of her family’s situation. Through a social worker, Annapoorni heard about the skill development training offered by our project Sumangali BMZ-C&A India (“Reduction of Worst Forms of Child Labour in Textile Supply Chains in Tamil Nadu”) implemented by our partner Community Awareness Research Education Trust (CARE T) and Trust for Education and Social Transformation (TEST). She took individual and group counselling sessions conducted by the Project, which led her to Computer Training. Soon she was enrolled in a one year computer course in MS Office, Photoshop and Tally. She was reemployed by the very mill she had previously worked in as a labourer, but this time as a computer operator and administration officer. Annapoorni now earns Rs. 8000/- a month, with which she now covers the house rent and takes care of herself and her mother. Annapoorni is very happy with her new job. “My life has been transformed. I now work in the office and I am addressed as “Madam”, which I could never have imagined earlier. Labourers in the mill are not at all respected, I am so thankful to the project for their support, without which this respect would have been impossible” says Annapoorni, with tears in her eyes. Recollecting her days at the project, Annapoorni particularly treasures the memories of Saturday fun activities like games and discussion. She is also part of Sumangali Activity Group and brings the project’s Skill Development and Education activities to the attention of deserving young girls.